Disk Repair is a logical bad sector removal and repair software that removes the logical bad sectors and repairs " Track 0 Bad Disks ". Bad sectors are a major problem in hard disks, which are found to be mainly logical in nature. 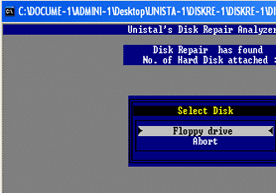 Computer companies usually have to replace the hard disk. Most often bad sectors spread and corrupt Track 0 of the disk due to which it doesn't get formatted, O/S doesn't get installed or copying data gives error. Logical bad sectors are irregularities on the magnetic media formed due to extensive read write operations, sudden voltage surges, certain viruses, corruption's in boot records etc. Disk Repair is a hard disk utility that repairs the logically formed bad sectors. Disk Repair realigns the magnetic orientation to make each byte read and write able and hence perform the easy hard disk space recovery. The software is simple to use and is helpful in many instances of disk problems. Removing bad sectors using Disk Repair will clear off all data/files/folders. If you have important data, it is advisable to recover your data before bad sector removal. Use Quick Recovery to recover data. A new 2TB drive costs less than this software.